THE PLAZA has a shiny bright painted exterior finish along with outdoor lighting for superior style. 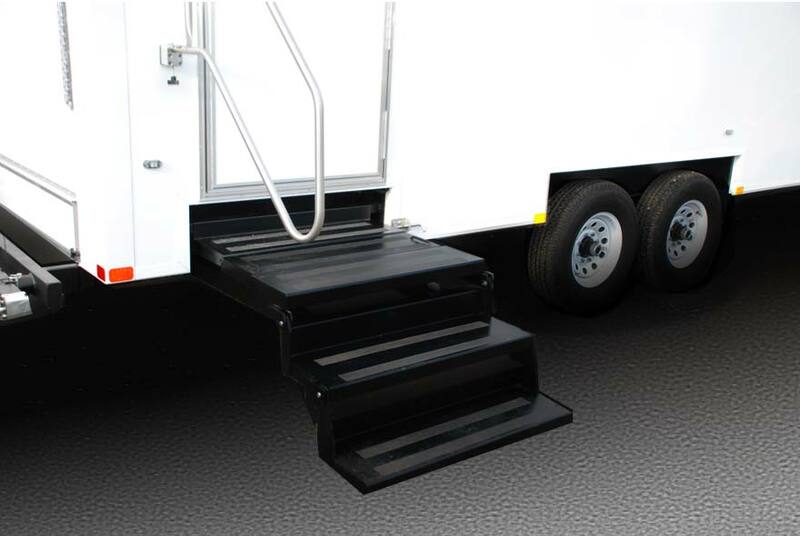 To enter the separate men's and women's bathroom facilities, guests will utilize the restroom trailers floating staircases both with stainless hand rails. 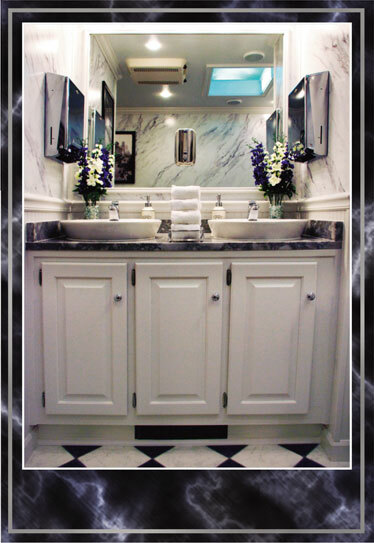 Once inside the luxury bathroom trailer, you will immediately notice the luxurious faux black and white marble flooring leading to the white wainscoting on the walls that goes to normal chair rail height. Followed by a faux marble finish leading all the way up to the ceiling, mimics a statuary marble commonly seen in mansions built during the gilded age. 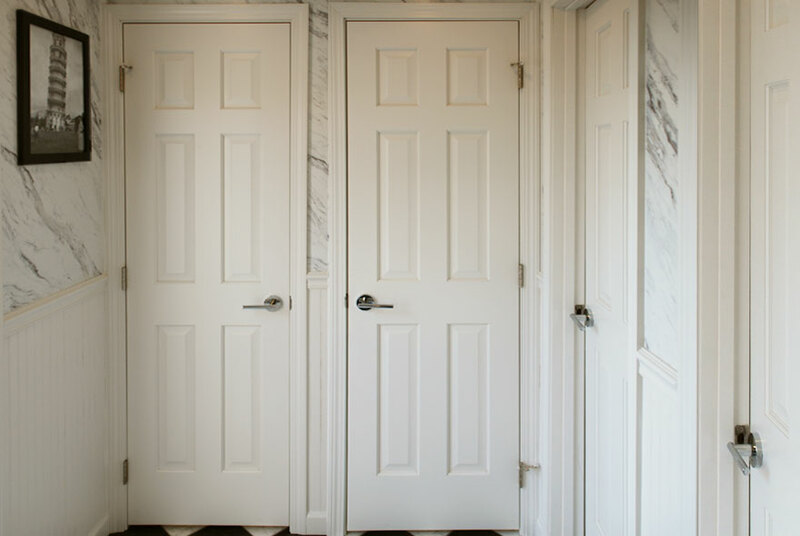 Traditional trim work includes base moldings, chair rail moldings, crown moldings as well as trim work around the door and door jams, exemplifies traditional details thru and thru. 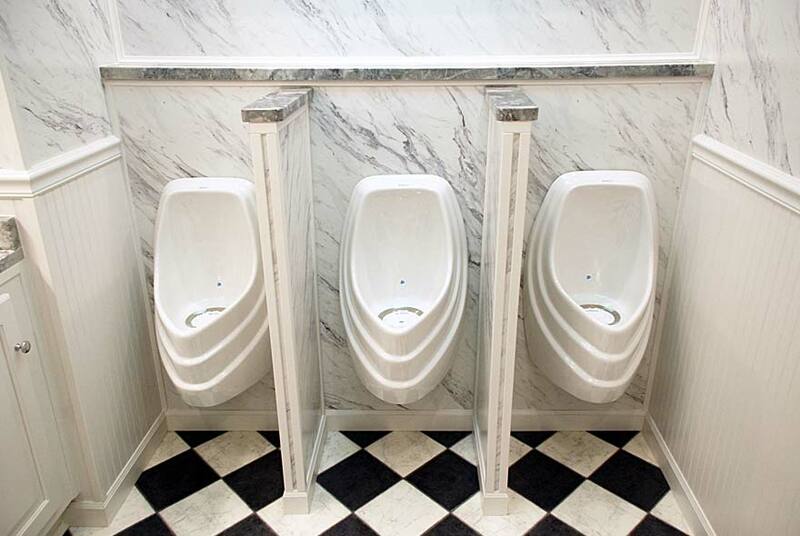 Beautiful grey and white granite countertops and shelving are throughout both the women's and men's restroom facilities, with granite caps included on the men's urinal dividers. All of the hardware within the restroom trailer is an aluminum or chrome finish that blends perfectly with THE PLAZA's decor. 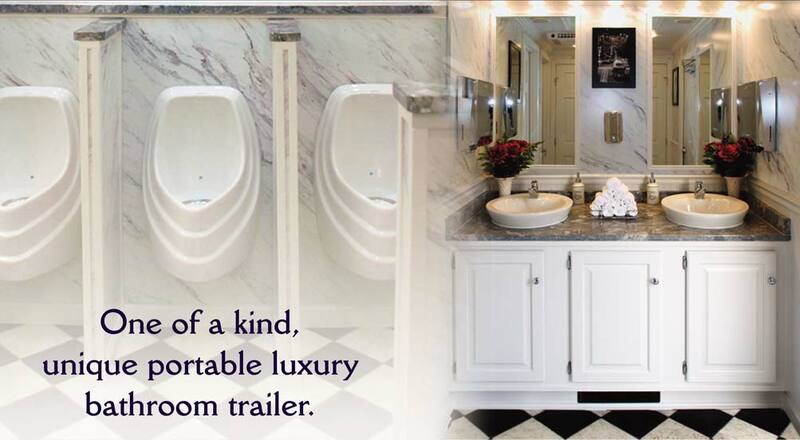 Elegant framed artwork is hung entirely through this luxurious restroom trailer to provide a true feeling of opulence. 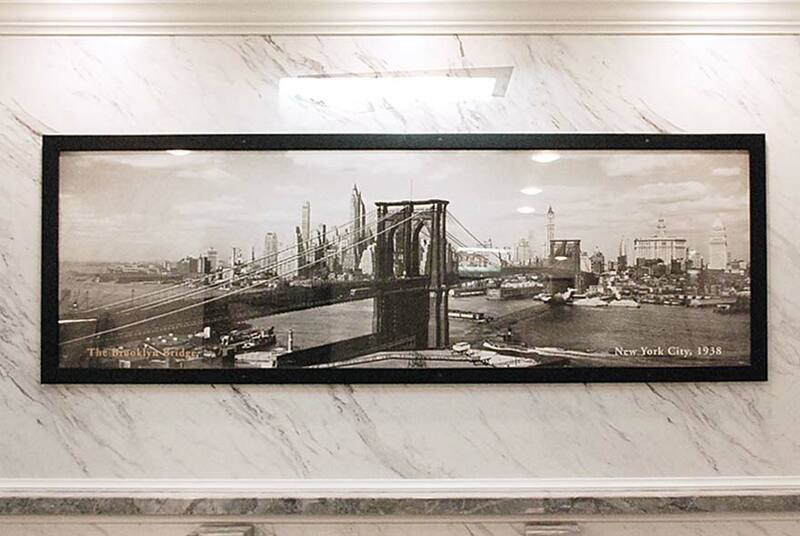 The men's restroom displays a prominent 1938 black and white framed picture of the Brooklyn Bridge in the main floor. While the women's side displays old pictures of Cartier's Jewelry Store on the corner of Fifth Avenue in NYC and Leaning Tower of Pisa, Italy, May 1955 in its main hall. The women's and men's bathroom stalls are all fully enclosed with lockable wood doors that go from floor to ceiling for complete privacy. Deep and roomy each with its own sophisticated artwork for an added touch of home. 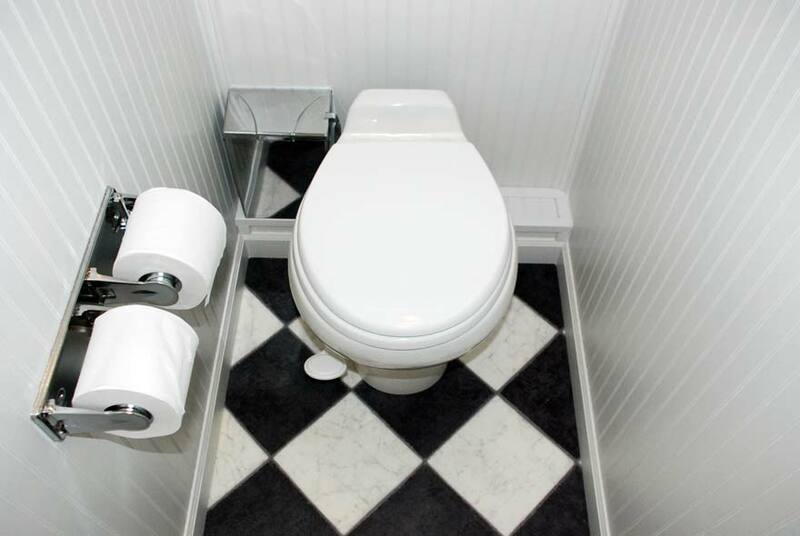 Every bathroom stall is also equipped with Sealand porcelain toilet bowls with a spring loaded pedal flush for easy hands free flushing that also allows for easy water adjustment if desired. All of the private bathroom stalls have granite convenience shelves while each women's stall also include a personal covered trash receptacle for easy disposal of sanitary items. 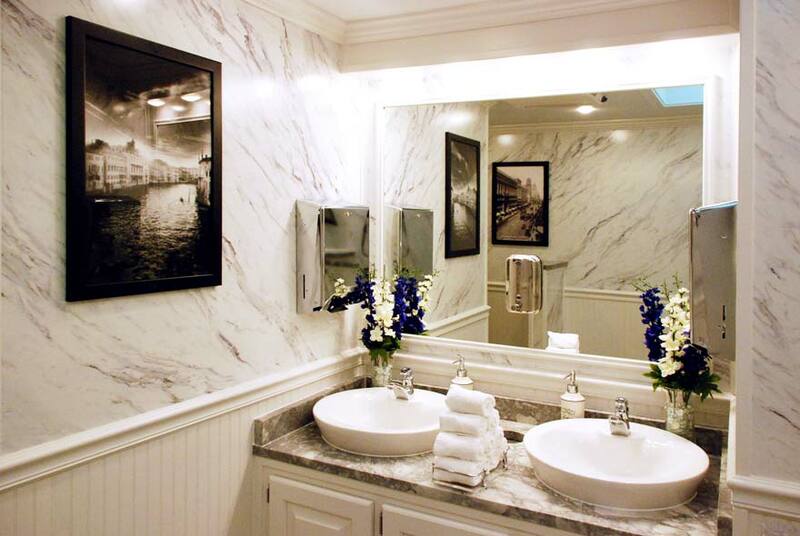 The main floor of the men's and women's restrooms each consist of two porcelain sink basins with beautiful grey and white marble countertops. The Moen brand stainless faucets provide hot and cold running water options that shut off automatically. Installed soap and paper towel dispensers are filled with antibacterial soap and twin fold paper towels. 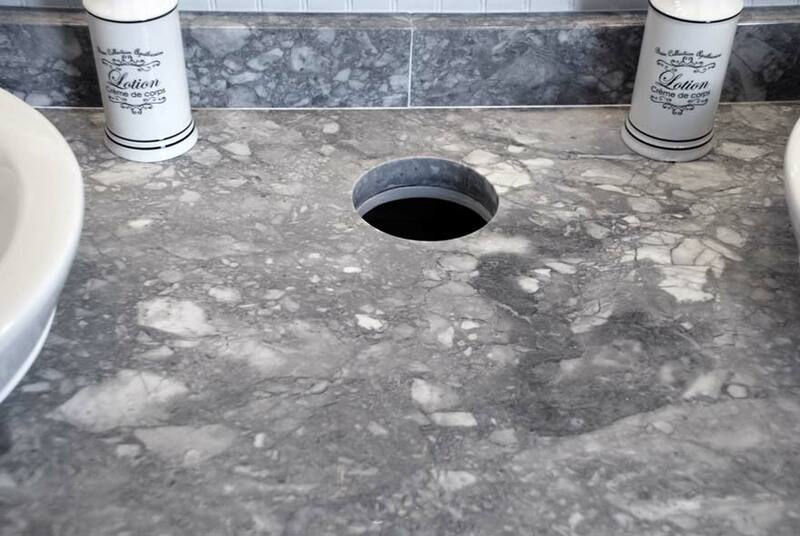 A trash receptacle is conveniently placed between the two sinks which will dispose trash beneath the sinks so the restroom stays cleaner. CALLAHEAD also offers the option of filled hand lotion dispensers and decorative hand towel accessories. 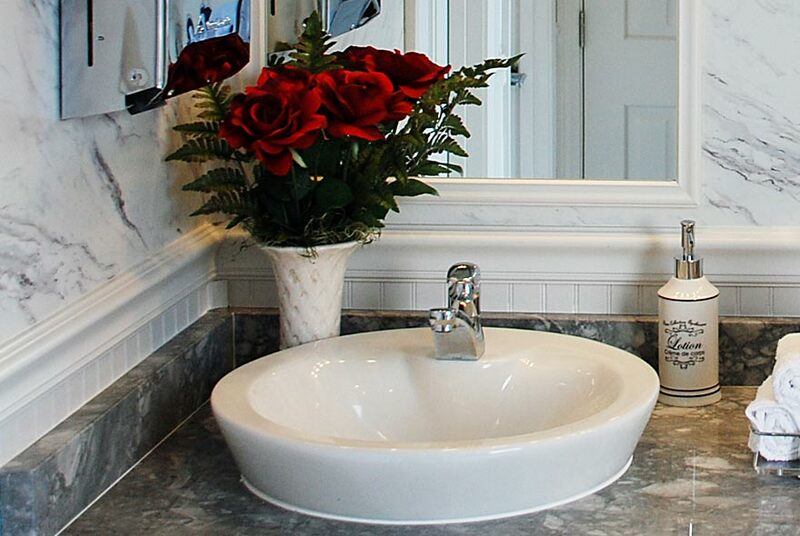 A vanity mirror and beautiful floral arrangements complete the elegance of the vanity area. 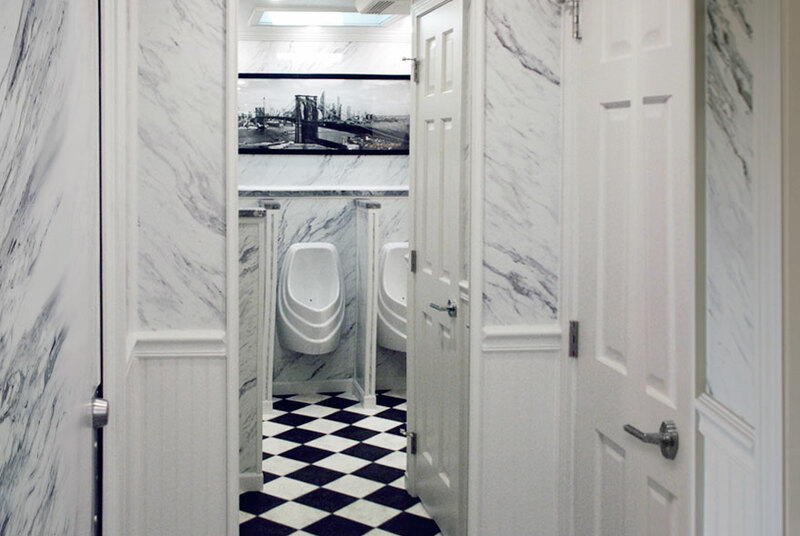 Both the men's and women's restrooms boast full length mirrors within the main floor which will be greatly appreciated by your well-dressed guests. 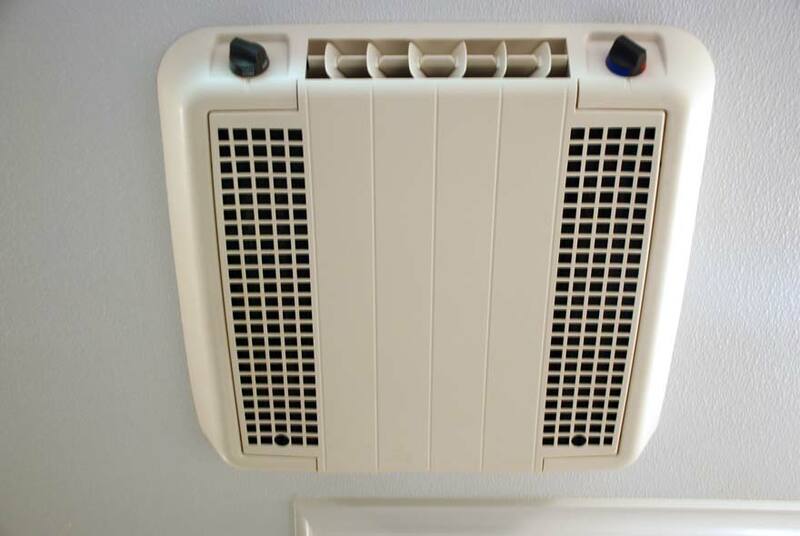 THE PLAZA luxury bathroom trailer is equipped with a hot air heat system and air conditioner that is thermostat controlled for complete comfort any time of year. 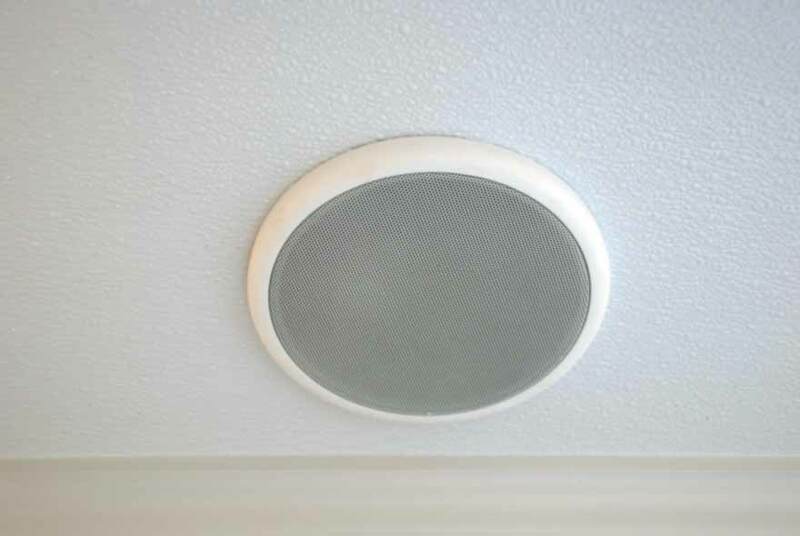 A central music system and speakers installed in the ceiling allow for music to be enjoyed by your guests even when they are using the restroom. 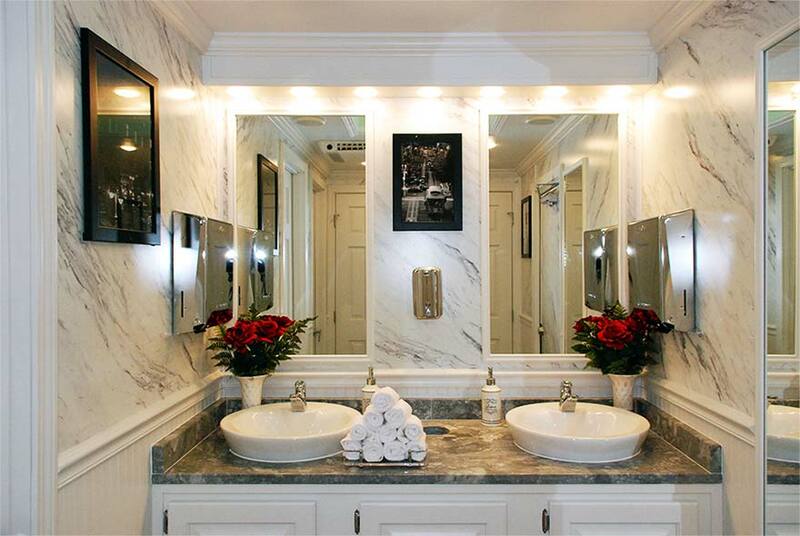 Two elegant wall sconces and low voltage lighting in the ceilings add ambience to this upscale restroom trailer. 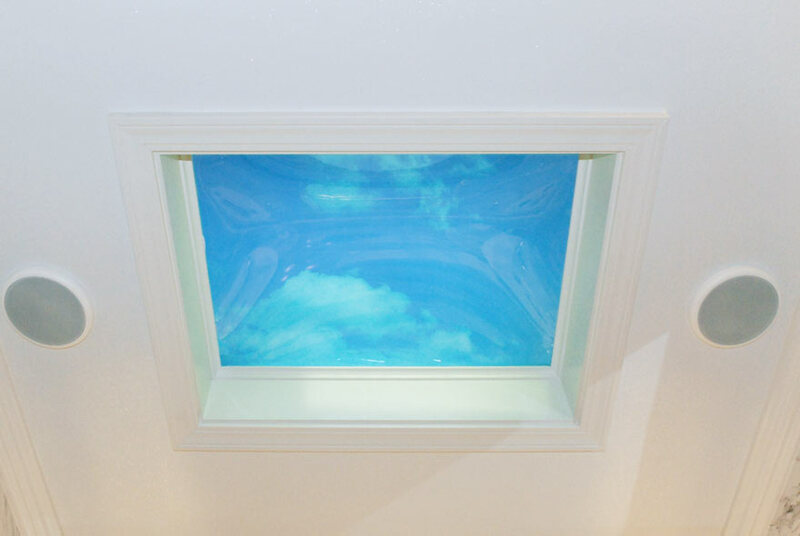 The restroom trailer' skylights throughout will supply natural light and ventilation. 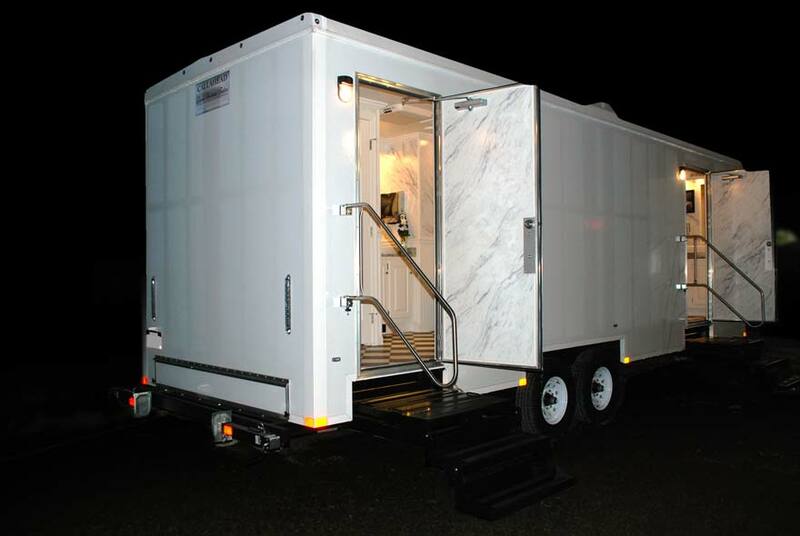 CALLAHEAD's PLAZA luxury restroom trailer will arrive at your location by a uniformed delivery specialist who will set up the restroom trailer at your selected location. It will take no more than 30 minutes to set up the restroom trailer to be in full operation for bathroom usage. 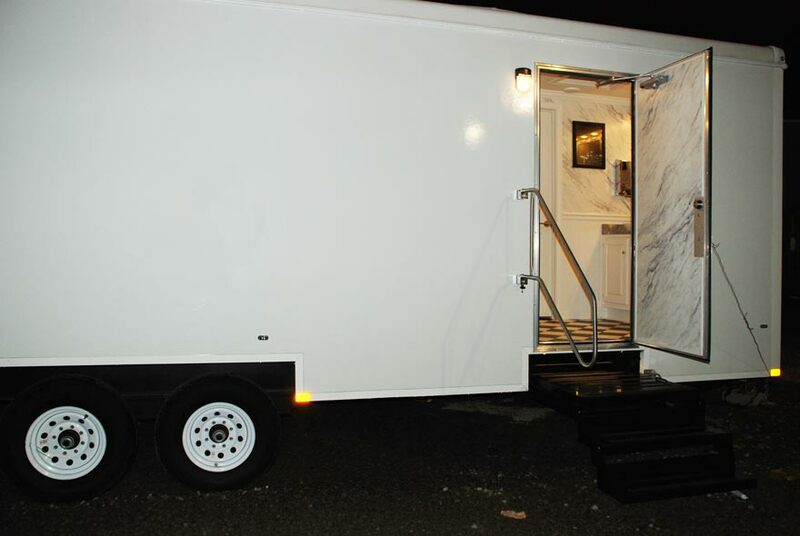 THE PLAZA restroom trailer operates completely self-contained with separate fresh water and waste water holding tanks. 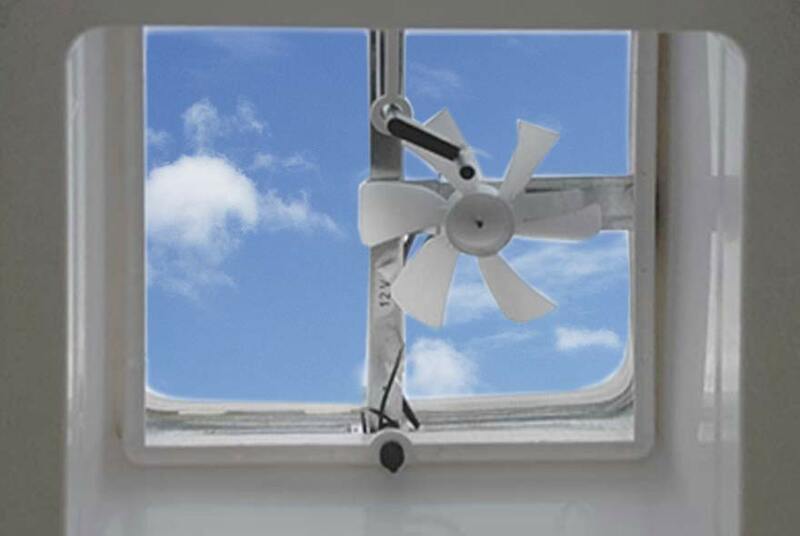 It was developed to handle bathroom use by hundreds of people at any event. A uniform restroom attendant can be available upon request to assist in maintaining all the plumbing fixtures and cleanliness of your restroom trailer for your guests so you are rest assured your bathroom facilities remain clean and sanitary during your entire event. If you want the best luxury restroom trailer for your wedding or black upscale event that will be sure to impress your guests, don't settle for anything less than a CALLAHEAD. 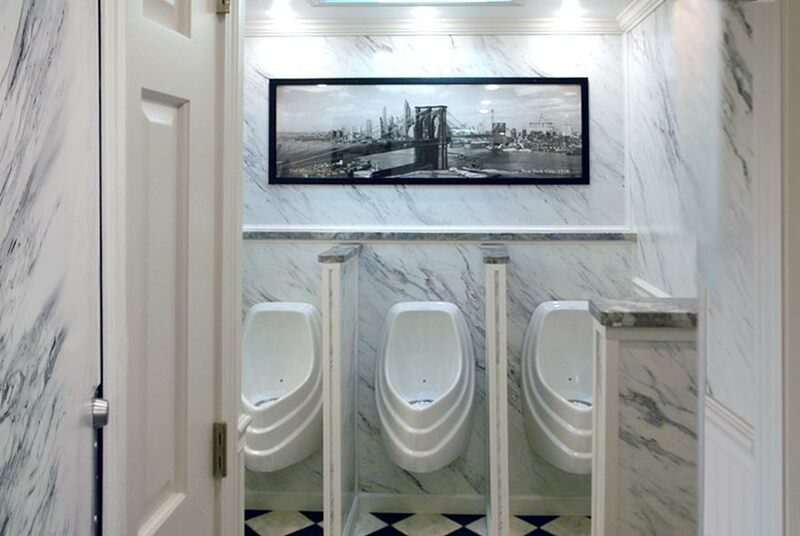 THE PLAZA was designed by CALLAHEAD to provide the most upscale public restroom experience for our customers and their guests. 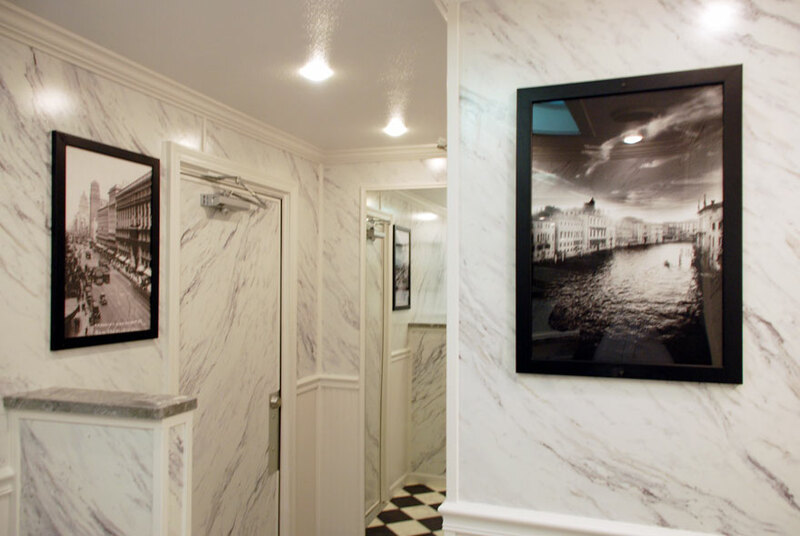 Equipped with all the amenities you would expect in an upscale catering hall, THE PLAZA restroom trailer will satisfy your most discerning guests. THE PLAZA is available for delivery throughout all of New York City's five boroughs of Manhattan, Bronx, Queens, Staten Island, Brooklyn and all of Westchester County and Nassau and Suffolk Counties all the way to Montauk Point on Long Island. CALLAHEAD has been providing new and innovative equipment for the portable sanitation industry since 1977 and is the leader in the field. For more information about THE PLAZA luxury restroom trailer or any of our other restroom trailers, luxury portable toilets, standard portable toilets, portable sinks, porcelain toilet systems for office trailers, guard sheds, holding tanks, fresh water delivery, commercial grade sinks, VIP portable toilets, standard restroom trailers, portable showers and portable storage sheds for short term or long term rental please contact one of our sales specialists at 800-634-2085 or visit our website for details and pictures of all of our unmatched equipment at www.callahead.com. Two fully enclosed bathroom stalls with lockable wood doors that go from floor to ceiling for complete privacy • Each bathroom stall is very deep and roomy • Every bathroom stall has Sealand porcelain toilets with a spring loaded pedal flush system so the toilet will never stay running • Hands free flushing toilet bowls • These toilet bowls automatically refill after each flush adding the appropriate amount of clean water for the next user • To add water to the toilet bowl easily lift the pedal flush until the desired amount of water is achieved • Toilet paper dispensers, convenience shelf and trash receptacle are in each bathroom stall • Every bathroom stall is decorated with its own artwork • 3 waterless urinals that conserves water and operates completely odor free • The urine is pulled down through a filter so there is never any odor causing issues inside the restroom trailer • A prominent framed 1938 black and white photo of the Brooklyn Bridge hangs in the main floor of the men's facilities above the urinals along with other sophisticated artwork. 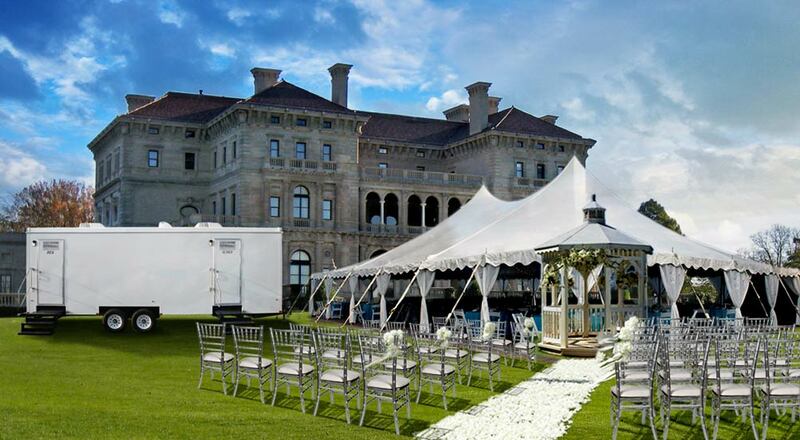 THE PLAZA is a CALLAHEAD luxury restroom trailer rental ideal for weddings, corporate functions, VIP events, black-tie parties or any upscale social gathering in need of outdoor restroom trailers. 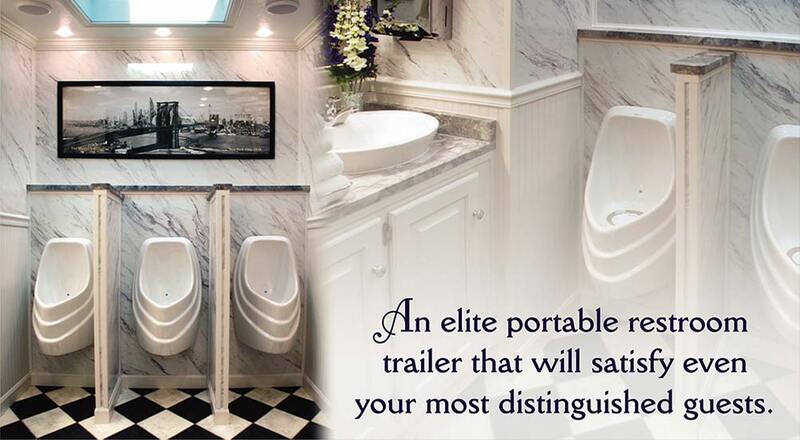 THE PLAZA is an elite portable restroom trailer that will satisfy even your most distinguished guests. 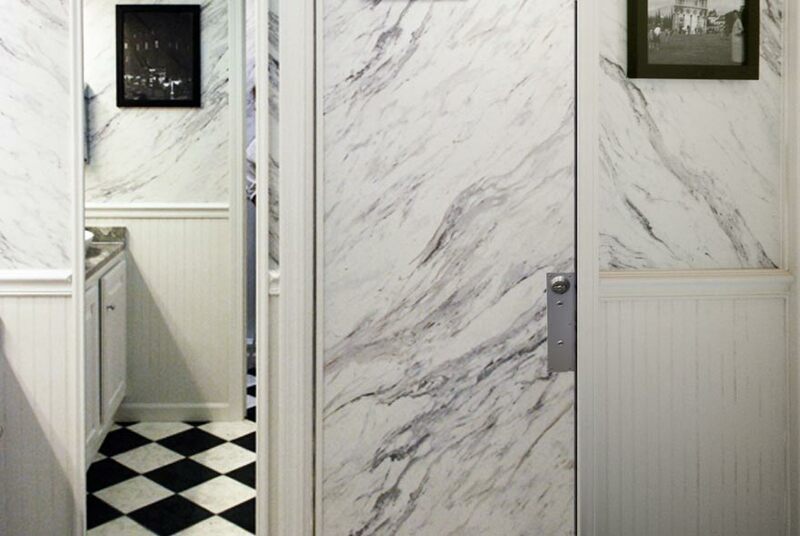 Designed by CALLAHEAD, THE PLAZA luxury bathroom trailer is the only one of its kind available anywhere. Separate women's and men's facilities each have completely private bathroom stalls ensuring guests the privacy and comfort they desire. The women's restroom is equipped with four spacious bathroom stalls whereas the men's side has two bathroom stalls and three waterless and odorless urinals with privacy dividers. 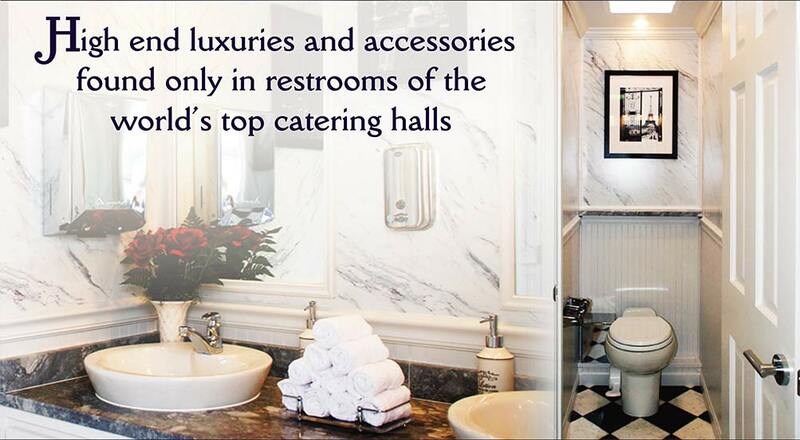 In addition to two full vanity sinks with granite countertops in each, THE PLAZA has all the high end luxuries and accessories found in restrooms of the world's top catering halls. 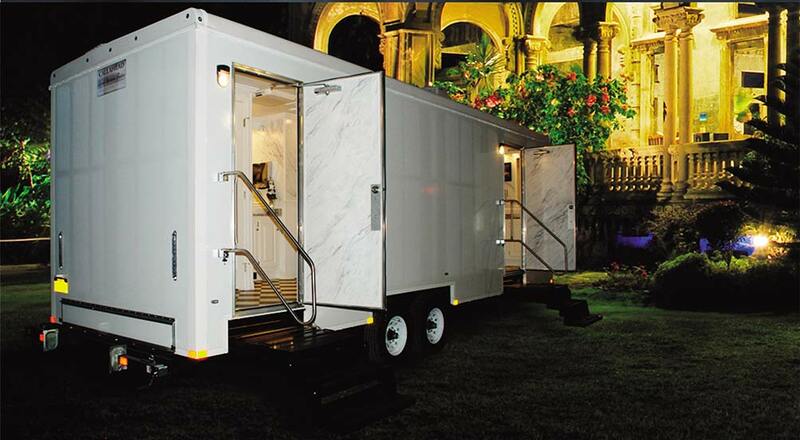 From the moment your guests step into THE PLAZA, they will be transported into one of the finest portable restroom trailers available. 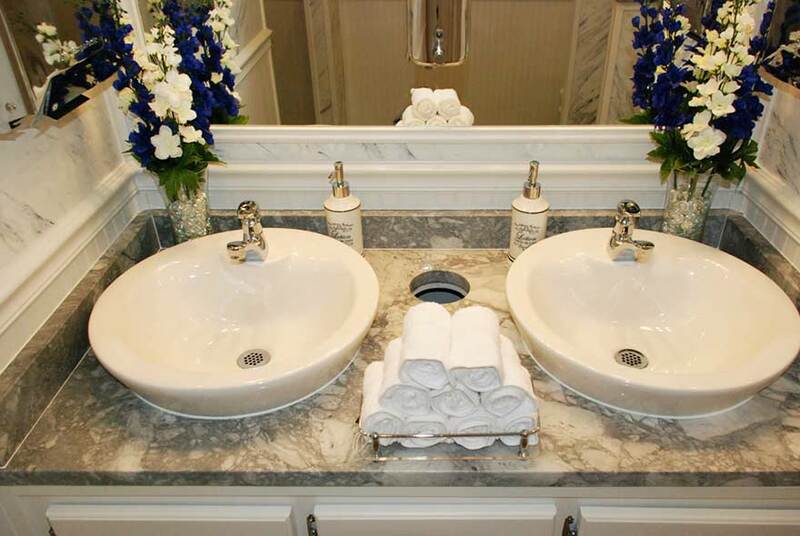 THE PLAZA's fine decor of faux marble and traditional trim work will give the feel of bathrooms of the gilded age as seen in mansions on Newport, RI. 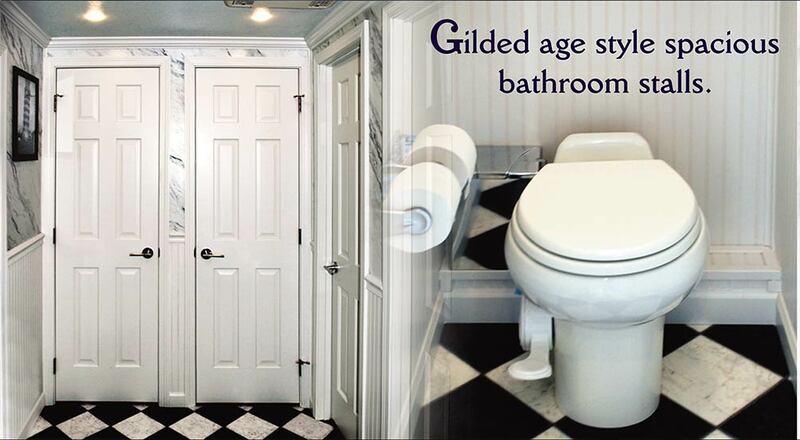 During the gilded age in Newport, mansions restrooms were furnished with only the highest quality materials that combined function and elegance. 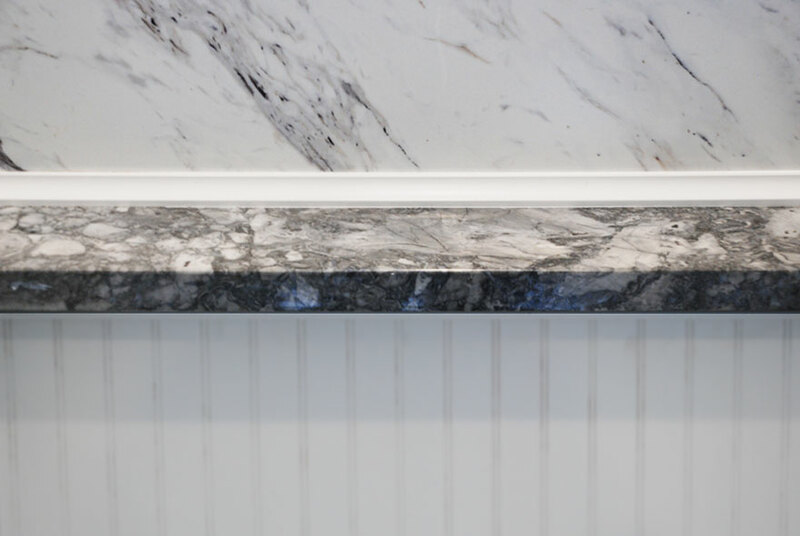 They were designed using crisp, clean, and cool colors of whites and greys such as, statuary marble and white wainscoting that looks rich, clean, and elegant. This is the look CALLAHEAD has mimicked with their PLAZA restroom trailer's design. 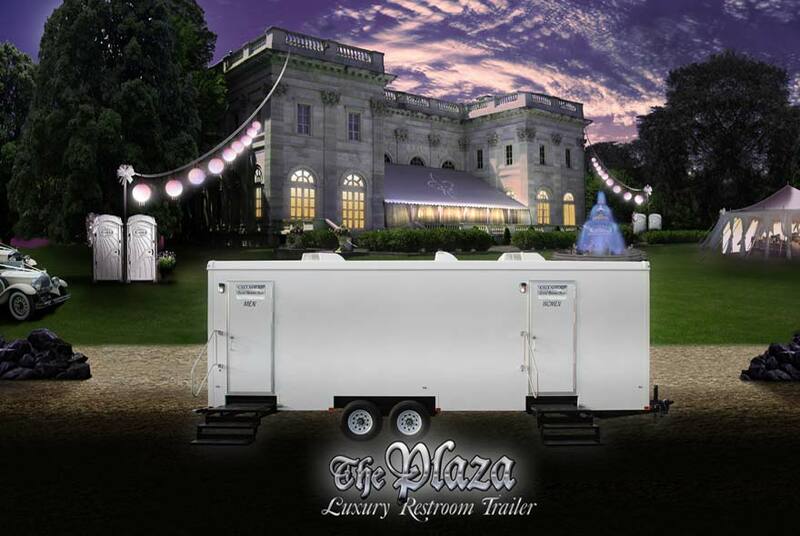 Combining innovation, function, and grandeur, THE PLAZA definitely sets the standard for portable restroom trailer luxury.